We’ve got another quick and easy DIY for you this week! 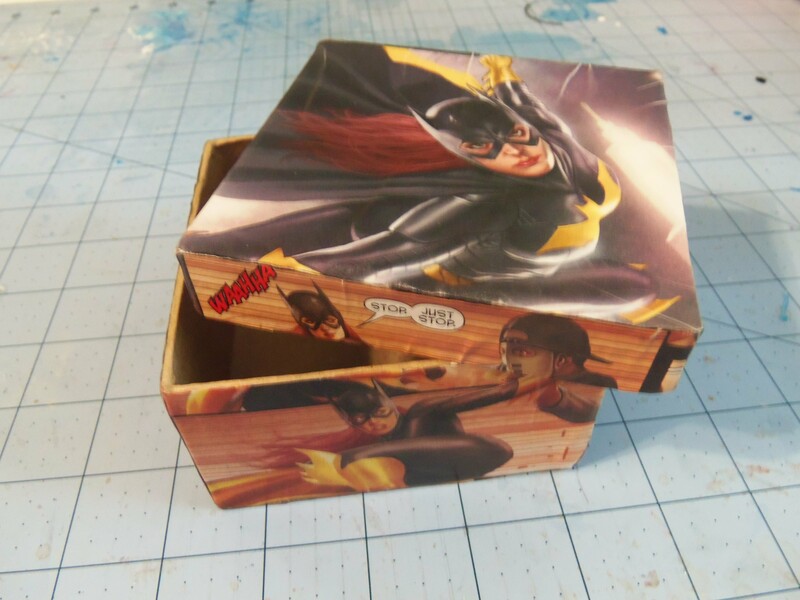 This comic decoupaged box is sure to dress up any gift. With the holiday season right around the corner, it’s the perfect time to make some presents extra geeky special. Use the box to trace the shapes you’ll need. Cut and lay out your pieces. While you can select your images at random, I enjoy creating a theme or color tone with my decoupage projects. In this case I made sure to find images that allowed half the box to be dark in color, and the other half to be brighter in color. Now it’s time to decoupage! The best thing about most decoupage projects is how simple they are, cut and paste, that’s really all there is to it. Doing this step over and over will result in a finished project within a fairly short amount of time. 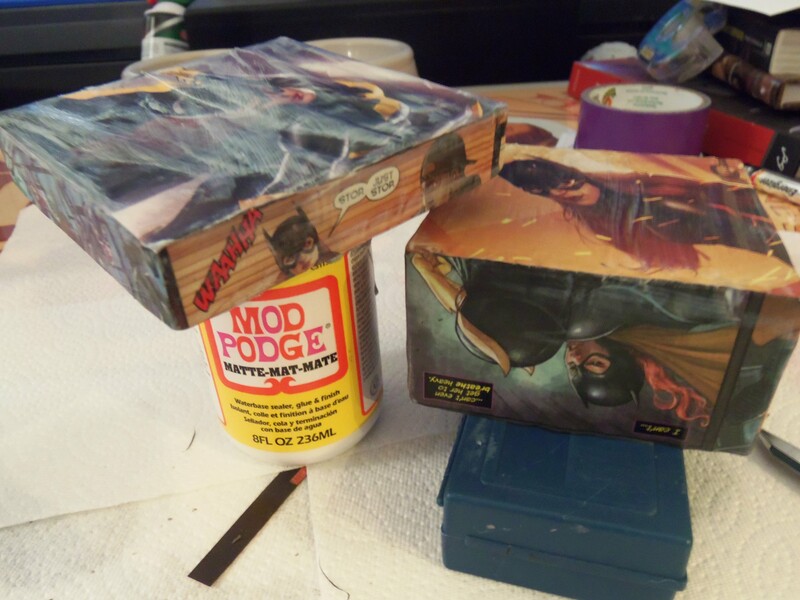 For this project, I brushed a layer of Mod Podge onto one side of the box. Then I stuck on one of the cut out pieces of comic. 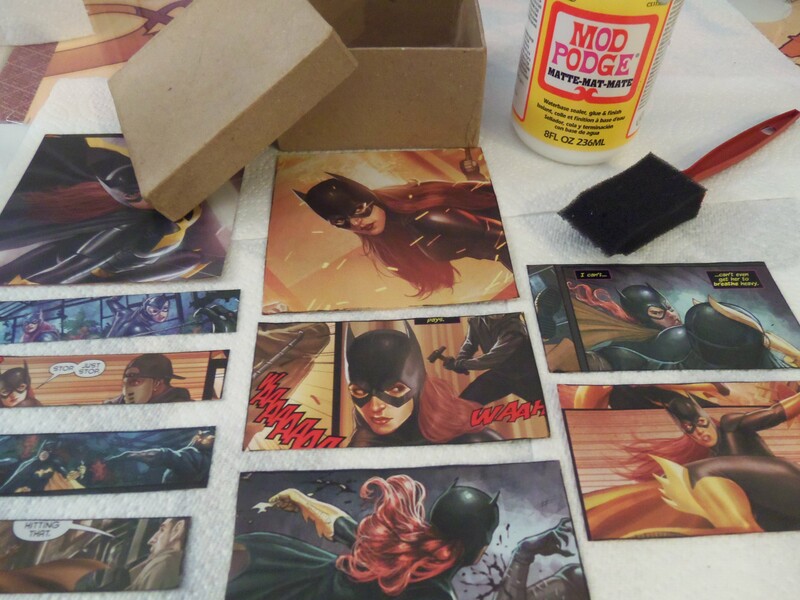 Once I made sure it was positioned correctly, I brushed a layer of Mod Podge over it to properly seal it into place. 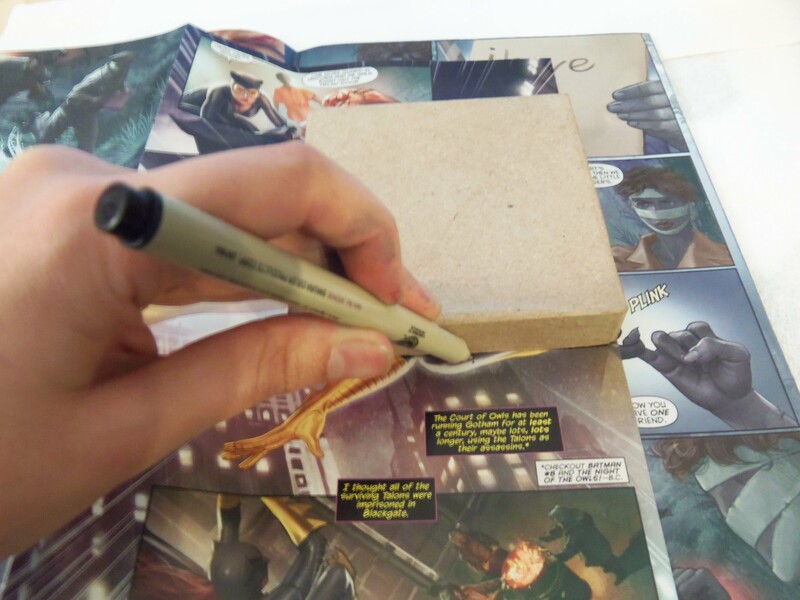 I repeated this step with every side of the box until I had all the comic pieces stuck to it. 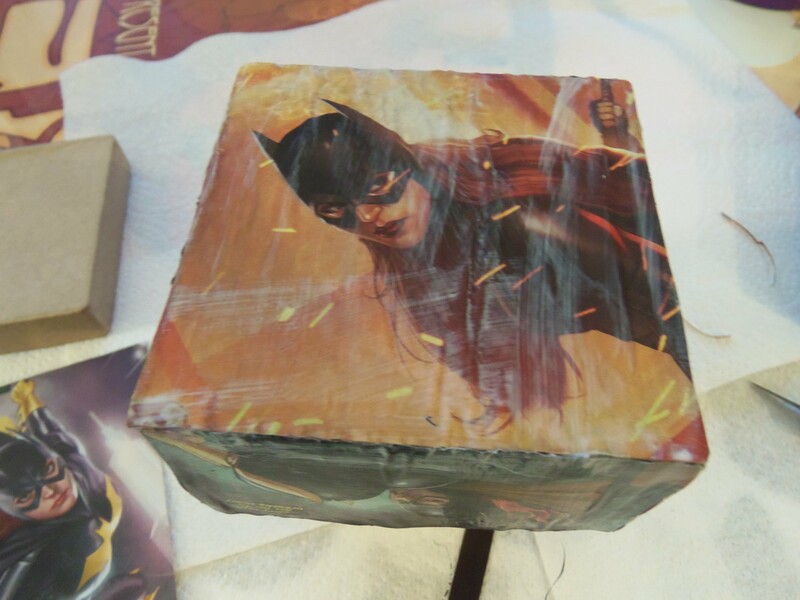 Once all the pieces were stuck to the box, I brushed on a few more layers of Mod Podge to completely seal everything in place. Don’t brush on all your layers at once. Remember, this is paper! If you dump on too many layer of Mod Podge at once, your paper will tear and become a big globby mess. For this project, I waited until each layer was dry, or almost dry, before applying the next layer. 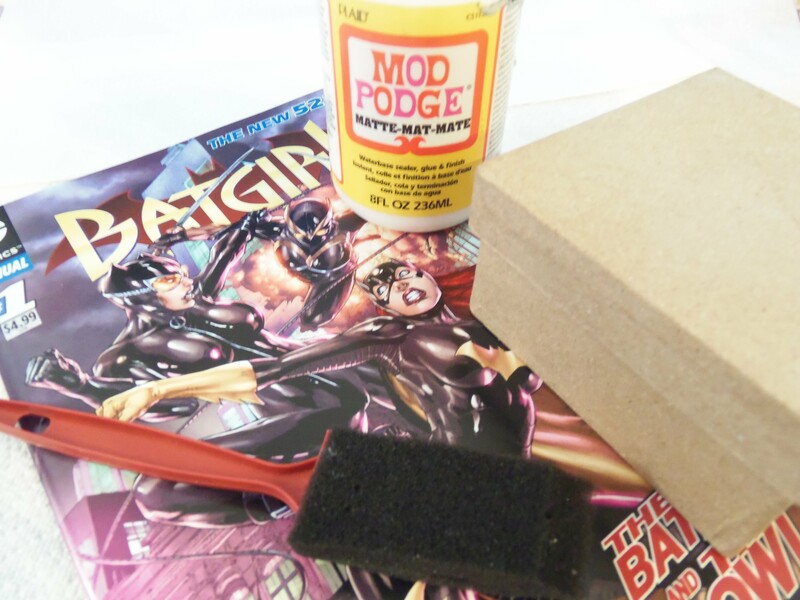 The great part about decoupage, of course, is that Mod Podge is both a glue and a sealer…so you can always add more layers of Mod Podge on at a later time if you didn’t put quite enough on the first time. Once you’ve let your project properly dry, at least overnight, it’s ready to use! A decoupaged box like this would make a lovely gift box any time of year. It’s fine as it, but you could dress it up even more by tying it closed with some twine or a ribbon, and/or putting a layer of batting at the bottom of the box if you’re giving something delicate like a piece of jewelry. I did this project, as I do most projects, while watching TV. It’s roughly a 1-3 hr project when you include all the drying time in between Mod Podge layers. 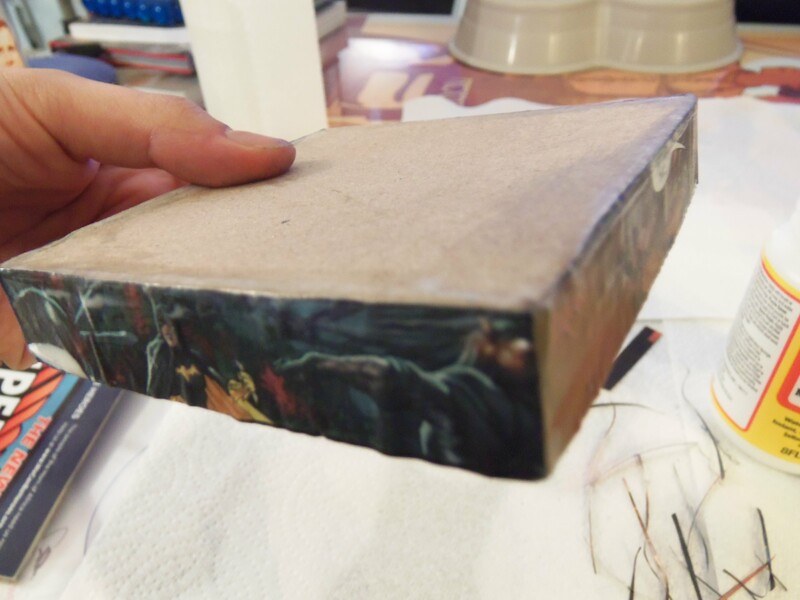 Obviously, the bigger the box, the longer it will take to decoupage! Of course, a gift box is just one thing this could be used for. It would also make for a great home decor piece to store items in, especially if you made a set of them. Thinking about using this project to geek up some presents this holiday season, or to display around your home? We’d love to see the results! Feel free to share it with us on our Facebook Page. This idea is amazing. In fact, I was thinking of doing something similar in my (soon to arrive) daughter’s nursery for some of the storage boxes. 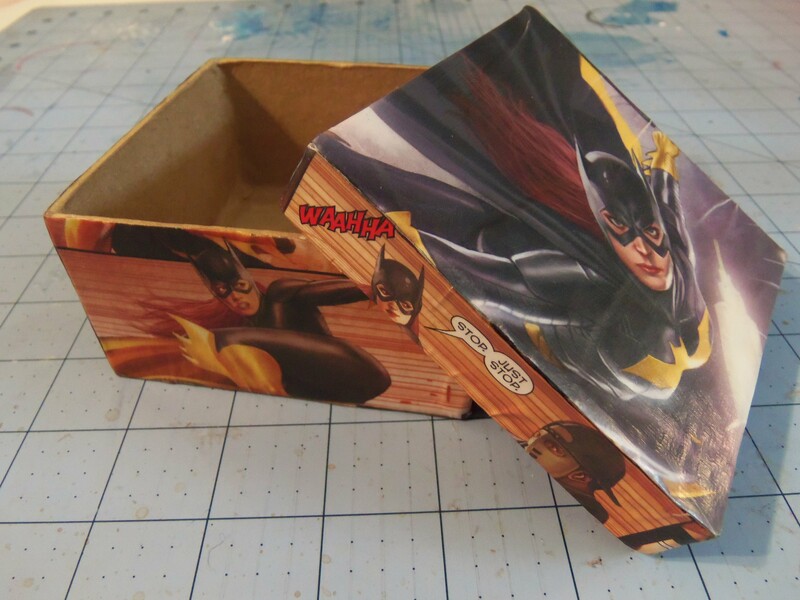 I’m planning on getting some comic short boxes to store things like diapers, clean towels, etc. because my hubby and I can use them when she no longer needs them to store comics. I’m also using some fun comic book heroine fabric to have a quilt made for her, so this idea fits right in! Now, to find some comics I can part with that have some completely kick-a$$ heroines!